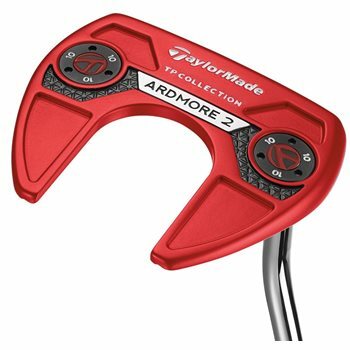 The TaylorMade Red TP Collection putters offer a combination of mid mallet designs with a wide array of sightlines, toe hangs and hosels to fit any stroke. Each putter features a 304 stainless steel head with a Tour Red finish and high contrast coloring for improved alignment. Classic milling creates consistent radius and shape while the adjustable sole weights provide optimal head weight. The Pure Roll insert provides optimal forward roll and a firm feel for every player, regardless of stroke ability. The Ardmore 2 putter is a progressive full mallet with two cavity and one top sightlines, face balanced toe hang, and a full shaft.